Scott will laugh at just how much of an understatement this next sentence is: I am a really emotional, sensitive, deep-thinking person. I ask a lot of “what if” questions and I ponder the past — A LOT. It’s just always been in my nature and I find myself going through ebbs and flows of where it takes a hold of me and I’m even more sentimental. 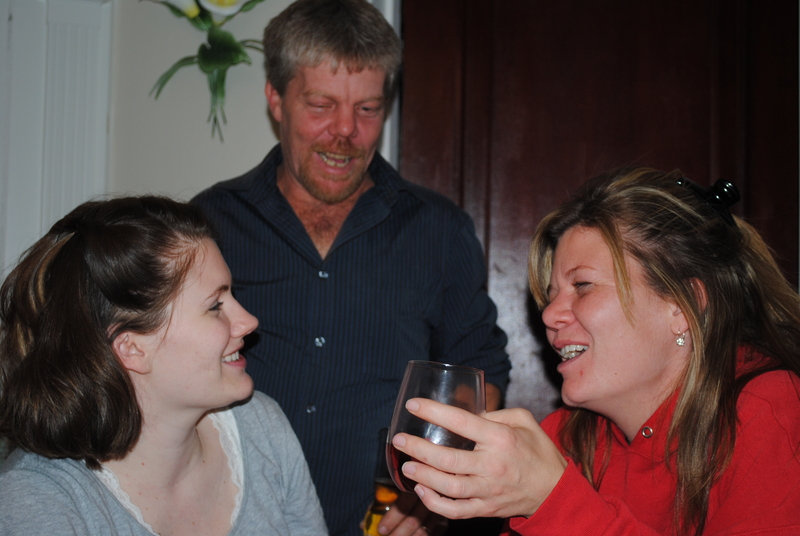 Anyway, the recent visit from my sister Shelby and brother Shamus (you’d never know we were an Irish family, right?) 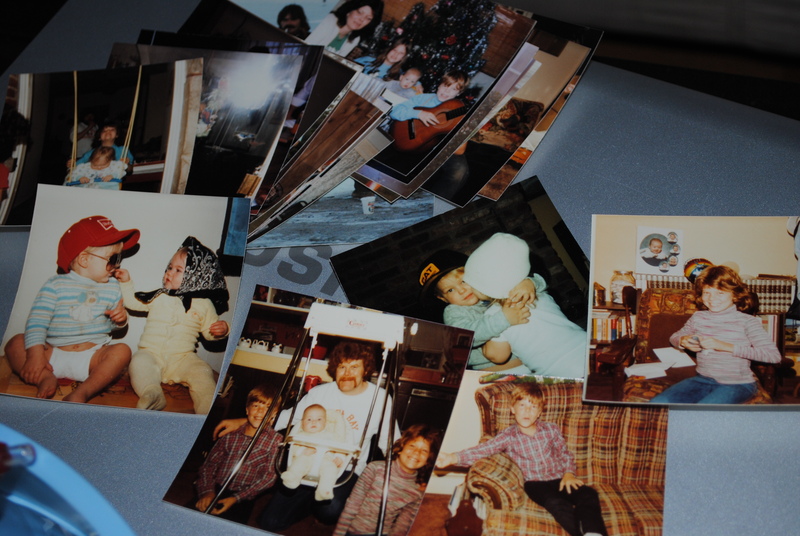 prompted me to bring out one of the many large boxes of photos taken by my mother during my childhood. I probably acquire two or three of these boxes every time I see my dad, who is as sentimental as I am, although with more packrat tendencies. I’ve received my mom’s old wallet, a broken watch, her drivers’ license and an envelope filled with my baby teeth, my mom’s lovely script in purple ink across the top. I appreciate it, but I would rather cherish the special or unique (or sentimental?) items of hers — things she made that I can decorate my house with or things specifically written for or about me, for instance. Shelby and Shamus and I share a biological father (not the man I call my dad) but had different mothers. We never had the chance to grow up together or share in life’s ups and downs — until now. We’re making up for lost time. There were envelopes filled with photos of people I didn’t recognize in some of my Mom Boxes and I decided to take a stab at bringing them out to see if my brother and sister could fill in some of the blanks.It was great! Shelby poured over the photos, writing names and family connections on the back of several of the photos and sharing stories of birthday parties, road trips and Christmas presents. There was a point in my life, not that long ago, where I thought I didn’t want or need to know the Irish side of my family. But now that I’m a mother, I feel I owe it to Zack to learn all I can about one-quarter of who he is and where he came from. It’s not all pretty, but it’s all family, all answers. Those old wounds are healed and sealed with hugs and kisses from my brother and sister. We look alike, we talk alike and we have many things in common. Answers again! 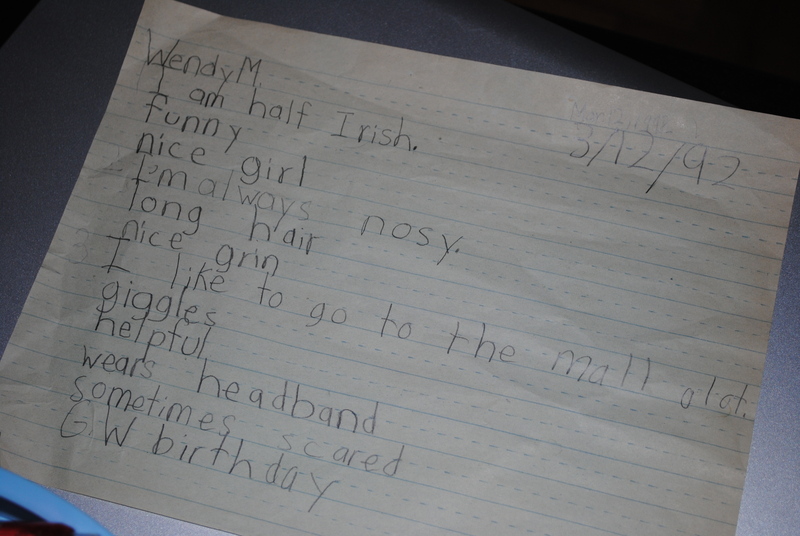 Line One: “I am half Irish.” How proud I must have been to be that ethnicity, to have that family, despite not even knowing my brother and sister at that point. And then the second-to-last line: “sometimes scared.” Imagine an eight-year-old girl who describes herself as being scared. I overcame that fear, although it took more than 15 years to do so. But then, the day I learned for certain that Zack had Down Syndrome, I felt that great fright creeping up through my throat all over again. And just like I would have used “always scared” as an adjective for 26-year-old Wendy, feeling as though I’d never be able to drop that description for words like “happy” or “strong”, here I am, just a few months later, more proud than ever and more comfortable with being the mother of a baby with Down Syndrome than I ever thought possible. I am no longer that scared little girl, not knowing who she was. And I am no longer the frightened new mother, afraid of who she would become. This entry was posted in Uncategorized and tagged Down Syndrome, Zee Momma. Bookmark the permalink. On a comical note, in 1992, I was a senior in high school about to embark on a crazy journey of 7 years of post secondary education. Funny how age differences mean nothing once you become an adult! What a beautiful post! You really do have it all together….I like to believe that God gave you and Scott the gift of your sweet boy because you are special people with so much love to give…Believe it or not, I remember that assignment you had. Your Mom called me and read it to me, wanting my take on the “scared !” We decided that you were just learning to be yourself and understand who you were and who you were going to be, and there was nothing to worry about! Except for your printing……LOL…Of course, she had the BEST handwriting..always neat and legible…..Something I always envied!